Last Sunday (6th December) I went to see the Yeah Yeah Yeahs at the Manchester Apollo, Manchester. How does one express what level of musical wonderment a certain band or particular song evokes? Why you come up with your own scale of musical wonderment.... Behold mine. The support band get a weird mix of 4 and 6, most of the time I thought urggghh shurrup! But then, when the poor possessed gal wasn't wailing, the band were really good. They are meant to be Punk/Dance? But where neither punky nor dancey enough for me. I think they should open for Lordi in the future. I would have much rather had someone like My Gold Mask opening the show, they are definitely the right vibe for the Yeah Yeah Yeahs. During the interesting warm up thing, my friend and I noticed that someone was dead/asleep, listening to the music, I almost envied them.. After Duchess Says had finished (hooray), the stewards shuffled over and poked the dead/asleep person, till they awoke. The person was then promptly escorted to the fresh air zone and never seen again. Runaway, Phenomena, 10 x 10, Heads Will Roll, Pin, Dull Life, Gold Lion, Cheated Hearts, Skeletons, Hysteric, Honeybear, Zero, Y-Control. Maps (Acoustic), Art Star, Date with the Night. As per usual with me, every song was the best, until the next one, but if I had to pick it would be.... oh bugger, I can't decide. I even created a playlist with the songs from the setlist, listened to it a few times and still no joy.So I had a look through the best youtube clips, websites and decided on this one.. It doesn't compare at all really to seeing them live, you can't bottle all that charisma and pow! into a a wee video playing on someone's blog. Get all the albums, listen to them loud and if you get the chance, go and see them live. As always, if you are on last.fm, add me and share your musical titbits with me, my profile is HERE. Brilliant! Glad you had a fantastic time! Love the Yeah Yeah Yeahs! New music for Jessica! I keep hearing about the Yeah Yeah Yeahs but have never actually *heard* them. Apparently my hair looks like the girl's? Or did? I love your blog. @Jessica, I am in shock! I hope you have listened now? 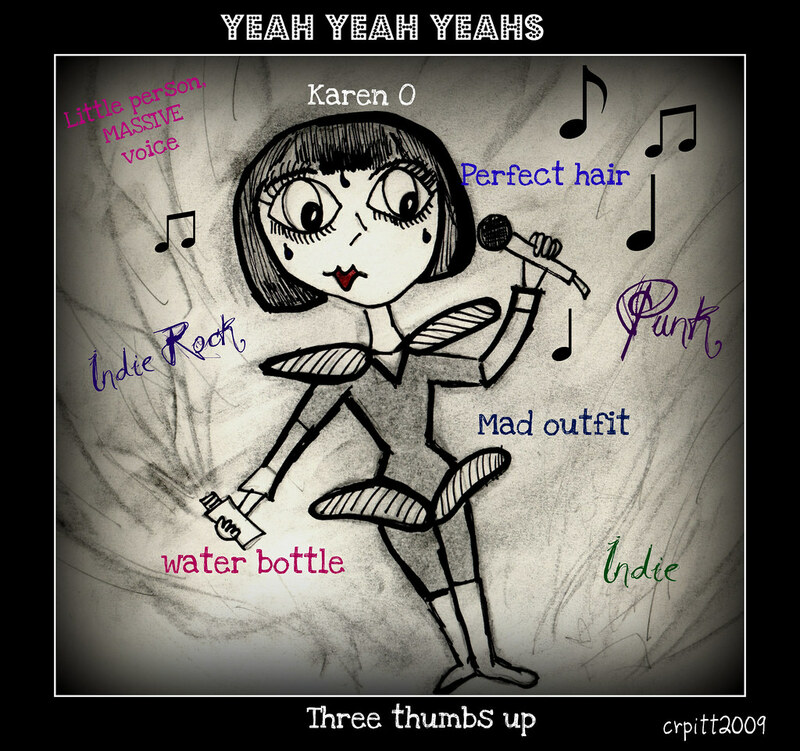 Karen O is everything That girl in Duchess Says wishes she was and could never be. The YYY's and Karen are fantastic, sometimes a bit too garage for my liking but at their best are up to the level of my 80's/90s post-punk heroes such as early Bunnymen/Joy Division/Chameleons UK and Radiohead or even modern Future-Folk artists on Fence Records. And Karen O's showmanship,voice and sheer passionate compassion-she literally gives her heart away to the audience-would put Freddie Mercury to shame. I may be a bitter and cynical old fool, having seen so many heroes fall, but despite this I am a convert to the cause of the Yeah Yeah Yeahs, It's even possible they could ascend to even greater heights. I really hope they keep on producing fantastic music.